UNITED NATIONS, August 7 -- "I am not a stevedore." So said the UN's head of Darfur operations Jane Holl Lute, using an archaic term for one who unloads ships. Asked to respond to the claim by Sudan's Permanent Representative to the UN, Abdalmahmood Abdalhaleem Mohamad, that the resolution as passed requires the UN to confer with the Sudanese government before endeavoring to protect civilians, Ms. Lute said she would let the Sudanese Ambassador's comments stand. Click here for a sample of his comments, and here for Ms. Lute's. Ms. Lute was dismissive of skeptics, including Jan Pronk, the UN envoy whom President al-Bashir threw out of the country for offending the Sudanese military, about whether the UN - AU hybrid mission to Darfur (UNAMID) will be hampered by its inability to engage in disarmament. "After the last DFS briefing in Room 226, I asked about a complaint, including of gem trading and other abuse, sent by email concerning MONUC, and asked to know how the complaint was investigated, and the outcome. Since then, sources in DRC have told us that a UN Peacekeeping "IndBatt simply stood by and took notes when FARDC Bravo Brigade looted non-food items distributed by UNICEF in North Kivu" in late July. This is a request for DFS' confirmation or denial, and comment." UNICEF is aware of the situation in North Kivu and sadly the looting by armed groups of civilians' possessions and supplies, including in some cases humanitarian non-food items, has occurred since the crisis escalated at the end of 2006. UNICEF is not, however, aware of any populations who have received UNICEF assistance via partner organizations and have been deliberately targeted after having received this assistance. While UNICEF provides some reassurance, UN peacekeeping for now provides little. Jane Holl Lute: "I am not a stevedore." At previous briefings, Ms. Lute has repeatedly pledged "zero tolerance," updates and accountability. 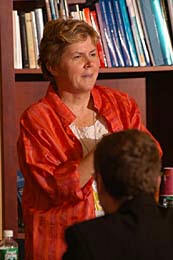 But given an opportunity to shift the discussion to an upbeat, some say Pollyanna presentation of a projected UN solution in Darfur, complete with references to underground lakes of water and materiel suddenly flowing through Port Sudan, Ms. Lute provided not a single update on a single unresolved UN peacekeeping investigation. Not into the procurement scandal recently alluded to in the Congo, nor of the 700 Moroccan peacekeepers confined to base in Cote d'Ivoire. A recent returnee from Cote d'Ivoire tells Inner City Press of a UN peacekeeping battalion wherein visits to shopping centers and massage parlors are made at 11 in the morning. Ms. Lute previous challenged the press to let her know when reports of misdeeds are afoot. But if there's no follow-through, why?